A columbarium is an alternative "Home" where to bring together the family to meet members who passed away. 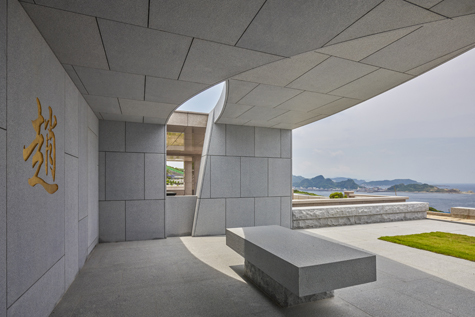 By holding a memorial service, the living recalls the dead in such a sincere ambience that the columbarium blurs the boundary as if the dead were brought back to life and reunited. Traditionally, a courtyard is a space prototype of the vernacular dwelling that is flanked and protected by two wings, "Cyan Dragon" for the east and "White Tiger" for the west. It is also a family center to host multiple activities like farming work or thank-god feasts that keep family members connected. 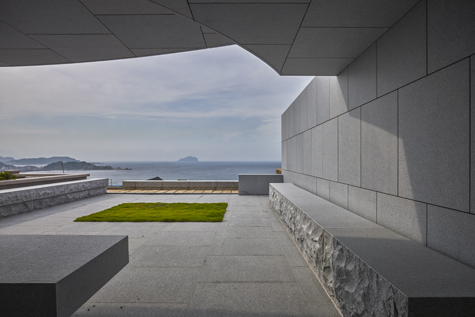 The columbarium park fronts the sea in the north and sits on a hillside from the south. The whole park is planned according to the terrain contour ; height differences are generated occasionally if needed to deal with the slope. 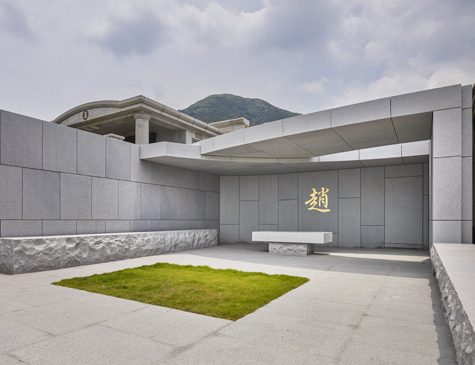 Every columbarium are placed side by side, every two of which might sit on the same height continuously or split into different heights by retaining walls. 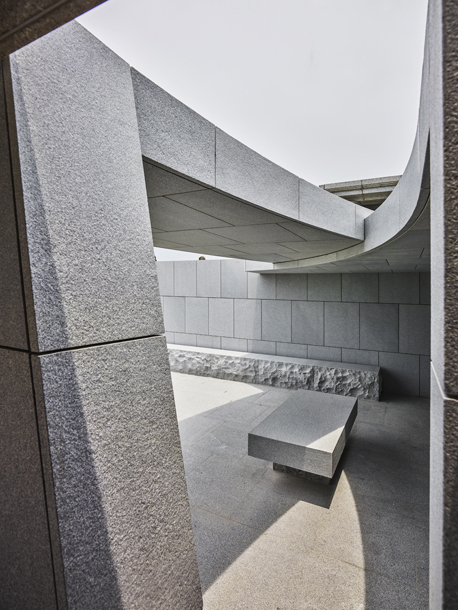 CJ Studio was approached to design one unit of the columbarium park and it was initiated from an idea of a court yard. The cinerary urns were kept in a storage room in the south end. 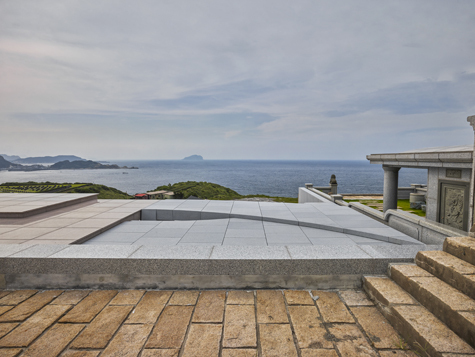 A court yard existed in the columbarium garden and open to a panorama overlooking the front sea. 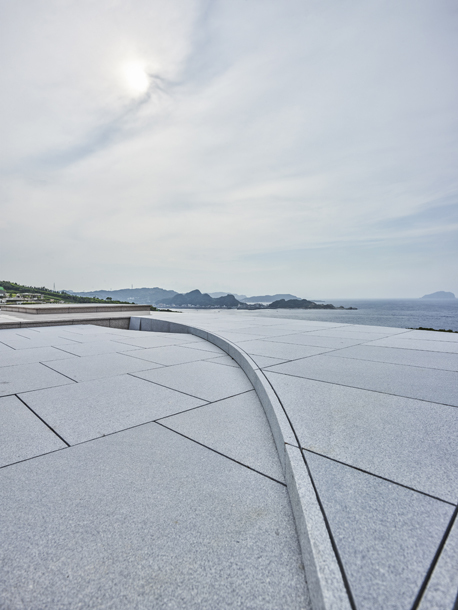 To the east, there erected a 3-meter retaining wall to adjust the slope and aligned continuously in a row to the west with other units. 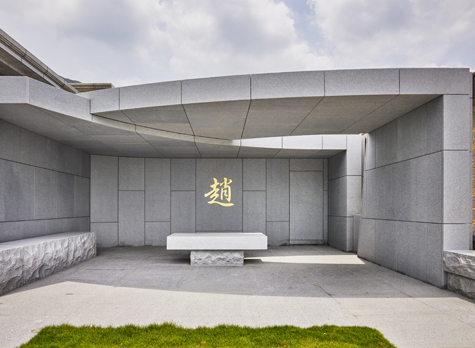 The columbarium was flanked by stone benches on both sides that acted like east and west wings to shape a patio image where to unite the family and express truthful memories. A square is a geometric shape and also equals to a Chinese character that means a court yard. A double square, one square within the other one, is also a Chinese character as well as an expanding archetype for vernacular residence. The roof of the columbarium garden covering the semi-outdoor space was comprised of two "L" shaped walls that intersected asymmetrically in the air. 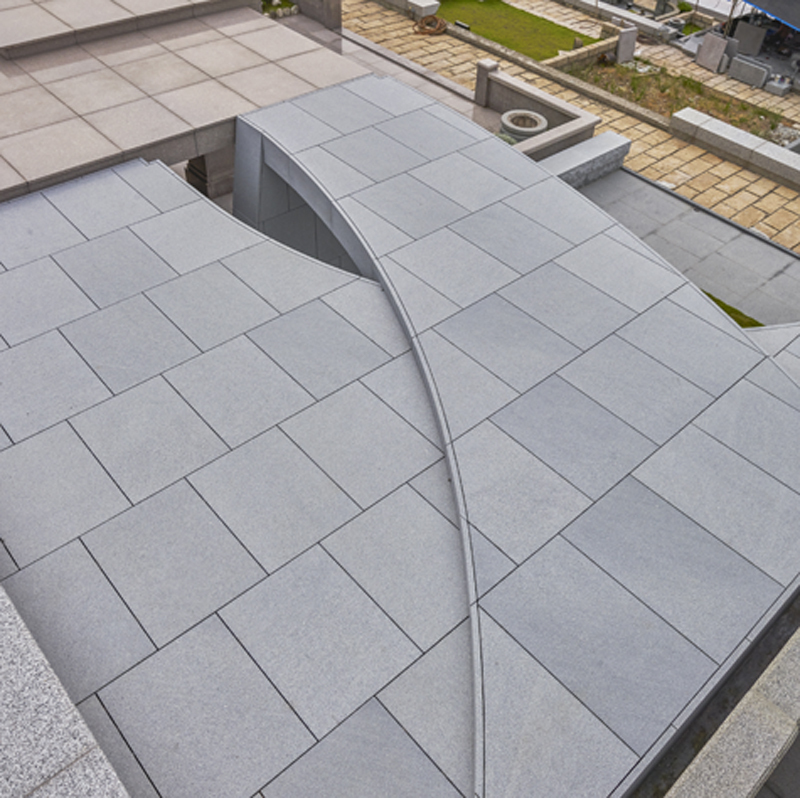 The void gap on the roof, a metaphor referring to a double square, defined the worshipper's praying area in front of the family columbarium wall. On tomb sweeping day, offerings were placed against the family wall or on a lifted platform before it. 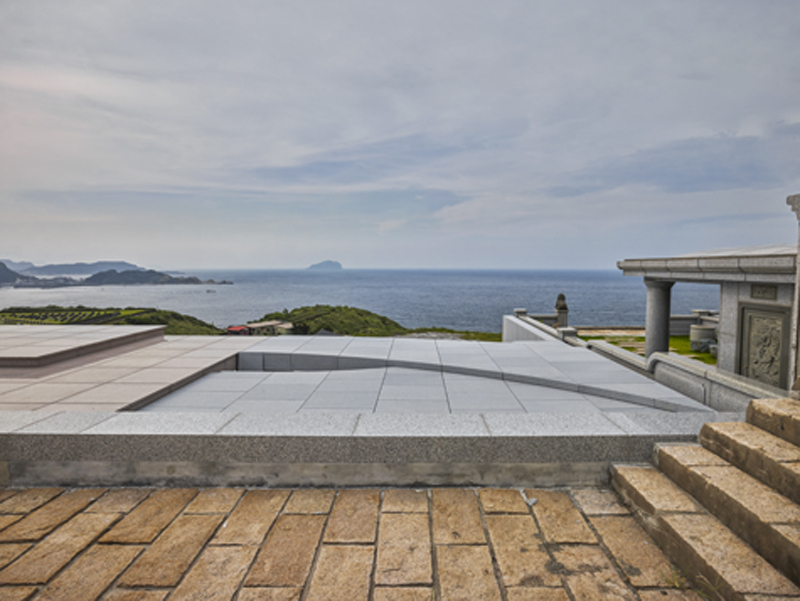 On ordinary days, worshippers could sit on the lifted platform as a bench talking to its ancestors peacefully. Or it could sit in the opposite direction admiring the beauty of the sea. The greenery grass in the court yard was also a hint for a double square implicitly that, with its soft texture, contrasted with the hard concrete texture. Eventually, with multiple variations of a double square, the space revealed a atmosphere that inherited the tradition as well as unfolded the family's bright future.